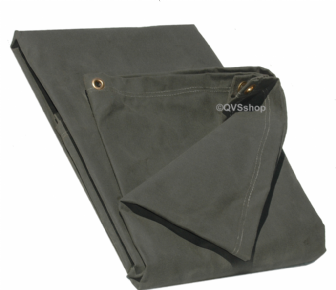 These Military Green coloured (a dark greyish-green) canvas tarpaulins are among the heaviest duty you will find (21oz). The sheets are approx. 700GSM in weight and are ideal for a range of purposes. The dark green colour is not only aesthetically pleasing but suitable for a range of uses in the garden, on building sites, for automotive use and for boats. The tarps come pre-waxed and are easy to maintain; we do provide a guide that helps you get the best from your sheet. Please be aware that these canvas tarpaulins are wax-proofed and dyed after manufacture so there can be a risk of colour transference upon application. * When using a tarpaulin to cover something, you should ensure that the tarp is well supported according to its size; the bigger the tarp the more support it will require. A tarp should not be hung by its eyelets only; this places unnecessary stress on the eyelets, which could then pull out if they are put under undue force or pressure. Please note: QVS cannot be held responsible for damage caused by product misuse, or where sufficient care has not been exercised during inclement weather. No guarantee is given to the strength of the eyelets, and so, wherever possible, you should always use additional fixing points to limit the risk of damage. * Appropriate measures should be taken in accordance with weather conditions and the application you are putting the tarp to. An assessment should be made; if strong winds are due, then you will need to take extra care in ensuring your tarpaulin is really well secured! It may even be necessary to take the tarpaulin down. * If water is allowed to pool and collect on the tarp this will increase the stress on the eyelets and also eventually let water seep through the tarpaulin. Therefore you should always position the sheet in such a way to allow excess water to drain off. * Please take care to avoid any sharp edges that could catch and potentially rip your tarpaulin. You should also be aware of contact spots or constant friction which could wear down and damage the material, thus reducing the lifespan of your cover. * In most instances, we recommend the use of bungee shock cord rather than rope, as bungee cord is a flexible product which will endure better in strong winds and reduces the pressure exerted on the eyelets. On large tarps we recommend that rope is run over the top side of the sheet; this acts to prevent the wind lifting (and therefore straining) the tarpaulin. * We recommend using all of the eyelets on your tarpaulin, and where possible using extra fixing points. By securing your tarp at every available point, you will limit the possibility of wind being able to get in underneath. A tarpaulin can act like a sail if caught, and this extra stress can inevitably lead to eyelets or seams ripping. * We recommend that you regularly check your tarpaulin for secure fixing, and to ensure that the sheet is fully in tact and undamaged. * If your tarpaulin does rip or split, we recommend that the damage is seen to as soon as possible. The sooner a problem is seen to, the less likely a rip is to worsen. *These canvas tarpaulins are wax-treated to make them water resistant. This does not mean that the sheets are waterproof, and they will require re-proofing after wet weather exposure to keep their water resistant properties. Suitable spray waxes can be purchased from most DIY and home hardware stores.